Listed By: Detroit Shipping Co.
Detroit Shipping Co. is a restaurant collective and beer garden built out of refurbished shipping containers. 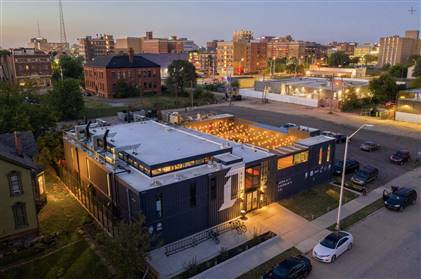 Featuring five unique food-truck style eateries, two full service bars, a coffee and ice cream booth, a small stage, galleries for local artists and retailers, and two private lounges. 10,000 square feet, two levels, half indoor, half outdoor. And all located within a few miles of everything you need in Detroit. 474 Peterboro, Detroit Shipping Co.